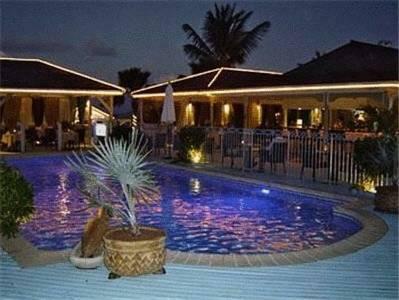 ﻿ Best Price on Hotel La Plantation in Saint Martin + Reviews! Located 600 yards from sandy Orient Bay Beach, Hotel La Plantation has an outdoor freshwater swimming pool with a sun deck. Free public on-site parking is available. La Plantation rooms are decorated in warm colors and have hand-painted wall murals. They have elegant teak furnishings and fully equipped kitchenettes. Some rooms include views of Orient Bay and the surrounding islands. The poolside Café La Plantation serves a tropical breakfast buffet each morning and a selection of fine gourmet cuisine in the evening. Other restaurants, can be found within Orient Bay village. After a day relaxing on Plantation’s private beach guests can make use of the free Wi-Fi available in the lobby lounge. The resort also has a tour desk that provides information on local attractions. Philipsburg Princess Juliana International Airport is located 6.7 miles from Hotel La Plantation. Grand Case is a 10 minute drive away. Upon check-in photo identification and credit card is required. All special requests are subject to availability upon check-in. Special requests cannot be guaranteed and may incur additional charges. Cafe Plantation Restaurant is open for breakfast and dinner, the pool area is also available. Les studio sont de grandes tailles, dans une zone résidentielle sécurisée, à 200 m de la plage avec une vue mer partielle. Ils sont propres mais font un peu vieillot. L’accueil est très local (faut pas trop en demander). Le restaurant (qui semble indépendant de l'hôtel) est au bord de la piscine dans un cadre très agréable. Il est fermé le dimanche et pas particulièrement bon marché.